And just like 1.3.1 this version adds support for a 20" Apple Cinema Display. But this time it's the older 2003 version with acrylic frame. Another new feature is support for multiple displays at once. (screenshot comming up later). There are also some other minor changes and fixes. 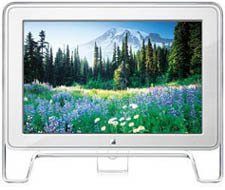 - Added support for 20" Cinema Display with acrylic frame. - Enabled multi screen support. - Fixed system tray right click menu position when DPI scaling is higher than 100%. - Lots of code changes including improved threading and performance. - Fixed some power management issues that might prevent the PC from going to sleep. - Brightness controller now requires .net 4.5 installed. Sometimes menu not opening, I don't know why (Windows 7 x64, Cinema Display 27") , but anytime, awesome programm. I can't reproduce that problem. Is it only a problem with 1.4.2 or other versions too? Are you talking about the system tray menu or the options window or the main window? I have looked some more at the problem and i can provoke a situation where eTools opens behind all other open applications when it is opened. It can occur both when starting the program and when opening the main window from the system tray. Sorry please that I was not answering you before, it's very cool that you found this bug. That's only reason that was holding me from say something like "best programm for anyone who have apple cinema display and windows". Again thanks a lot for your work, I will wait for new version. Good luck. Thanks for great app! None of my 3 apple computers were able to change brightness of repaired Cinema display. But your app actually did it. Awesome.